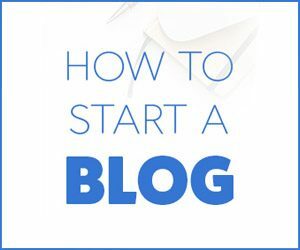 Some links on slightlysorted.com are affiliate links. Please see the disclosure tab on the main menu, side bar or footer for full details, thank you! 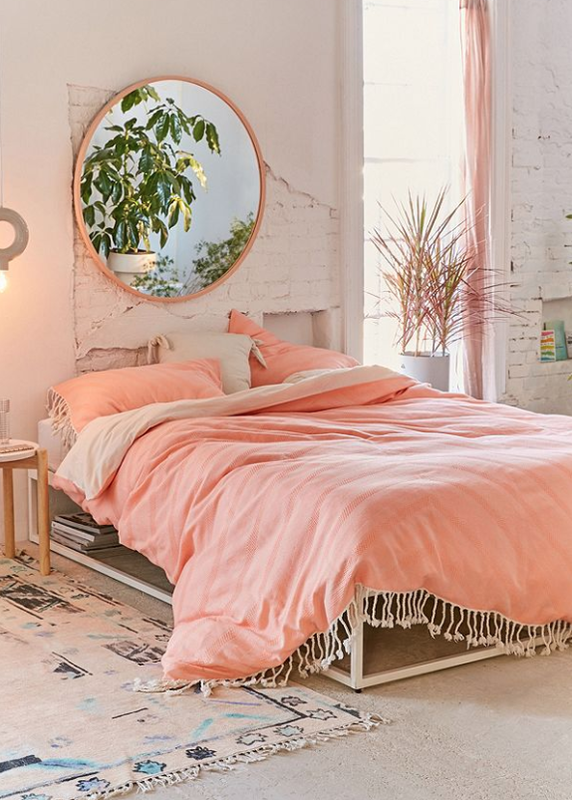 Just take a look at this gorgeous bedroom from Urban Outfitters (always worth checking them out if you’re embarking on a bedroom makeover)! The large mirror over the bed is a fantastic way to brighten up the room by reflecting the light, which immediately creates the impression of more space. Not only that, it acts as a stylish focal point, so the focus of the room is on the beautiful bed and mirror, rather than on the lack of space. A large mirror can work well anywhere in the room, but can be particularly effective over something you want to make a feature of (like a gorgeous bed), or opposite the main light source to create as much brightness as possible. I love this pink tasseled duvet cover too (also available in grey). The light color is perfect for creating a light bright feel. If you’re going to use up space with a bedside table, then make sure you utilise that space with something that offers a decent amount of storage. A three-tier trolley is perfect for keeping everything accessible while providing lots of room for your bits and bobs. I think this mint colored one on freelancerfashion.blogspot.co.uk is beautiful, and the great thing about these trolleys is that you can easily spray paint them to match your color scheme. If you don’t think you’ll be able to keep things tidy enough to be out on display, try something like this simple white step stool on Amazon. It’s just big enough to keep the bare essentials on show, so there’s no chance of things getting untidy, and you can hide away the bigger items like magazines and night-creams inside the hidden storage. White is hands-down the best color to use to create a feeling of space and light, and it need never be boring. You can choose to use a white canvas and add color pops, or go white on white with some stylish detailing. Here’s a beautiful example of how you can use a white canvas and add in some beautiful color pops (bintihomeblog.com). Choose a few really beautiful bright accessories, and the white backdrop will mean that they stand out really well and become focal points in the room. You can find some great inexpensive white bedlinen at Target, and see below for some gorgeous color-pop ideas! Alternatively, go for the ultimate light and bright option, with white for all of your decor. Don’t think that all white ever has to be boring! A plain white color scheme can actually be one of the most stylish bedroom ideas for small rooms. Adding in a few well-chosen accessories and some fairy lights, can create a really pretty bedroom (like this one from ciderwithrosie.com). How gorgeous is this lofted bed from projectnursery on Instagram?! 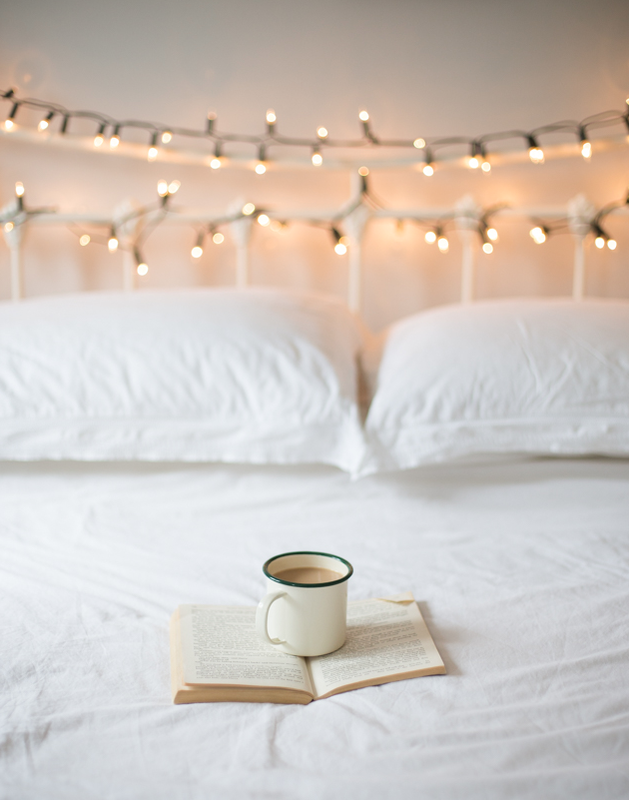 Lofted bed spaces aren’t just for kids you know! 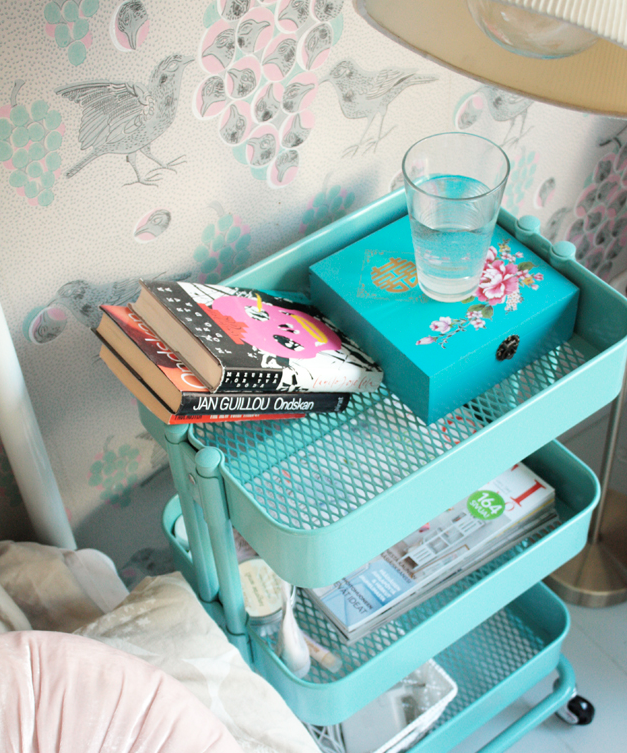 Utilising the wasted space high up in your room will give you LOADS more space at floor level. And they can look seriously gorgeous! While something like the example above will require getting a professional carpenter in (but the result will be so worth it! ), you can get something similar on Amazon. If you’re going for a standard low level bed, make use of this concept as far as possible by making sure you get a bed with plenty of storage space underneath. Or, if you have to stick with your existing bed and have one on standard legs with space underneath, get some bed risers to lift it up a notch for extra storage space. 5 – Or Go Low! 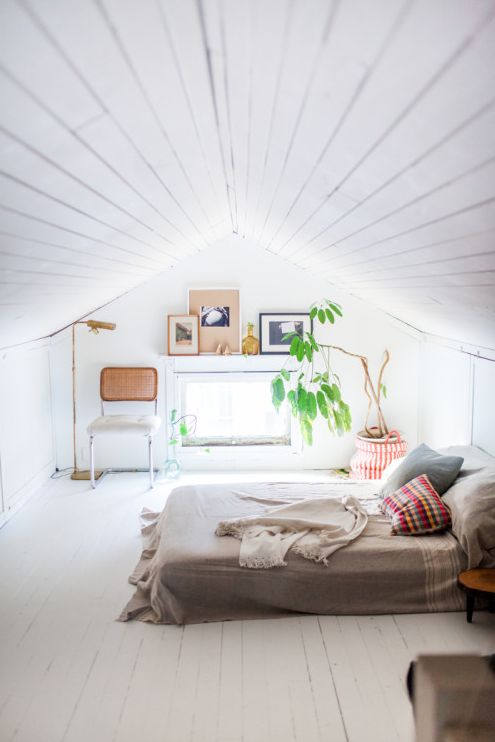 Alternatively, if low ceilings are an issue, it needn’t be a problem, as demonstrated in this example from designsponge.com. If you’re in a similar position, the best solution is to try to move everything else down a notch too. This is easy when it comes to your bed, as you can just do away with a bed-frame and put your mattress directly on the floor. Make sure you have a good quality mattress so that you get the support you need. You can take this concept to the next level by investing in a stylish futon. This way you get the low height for the bed, but you can move the whole thing out of the way to give you more space and a seating area during the day. Depending on your sleeping preferences, you might find that futons can be a little on the firm side, so if you’re investing in one you may like to get a mattress topper too for some extra softness. When you have a small room, you can’t afford to waste space! A slim shelf at the top of your bed, either at the top of your headboard, or in place of it, is the ideal spot to store bits and pieces and display stylish accessories. Depending on the width of what you want to store, picture rails can work well for this (perfect for the wall art print in the image above). If you want to display something like the gorgeous retro phone above though, you’ll need something with a little bit more depth. 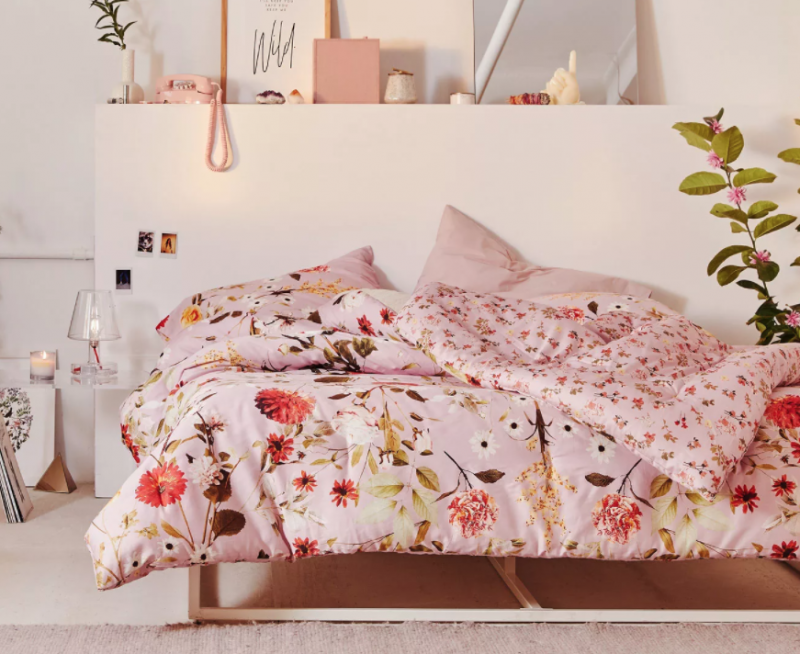 (The floral bedding is available here). 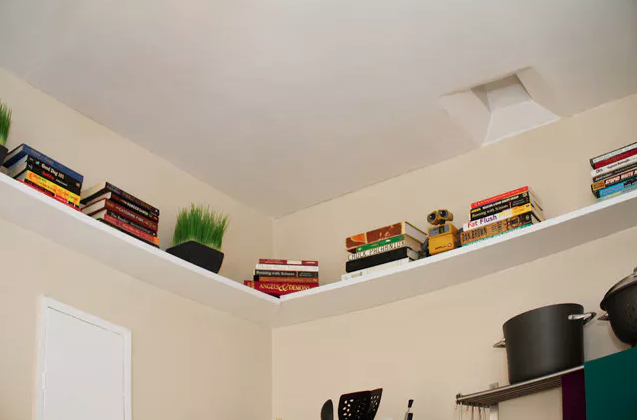 Another good tip is to install some shelves really high up, and use them for books and other items that you rarely need access to. This way they’re out of the way, but not taking up wall space that you could be using for a beautiful mirror or bright wall art (this example is from apartmenttherapy.com). 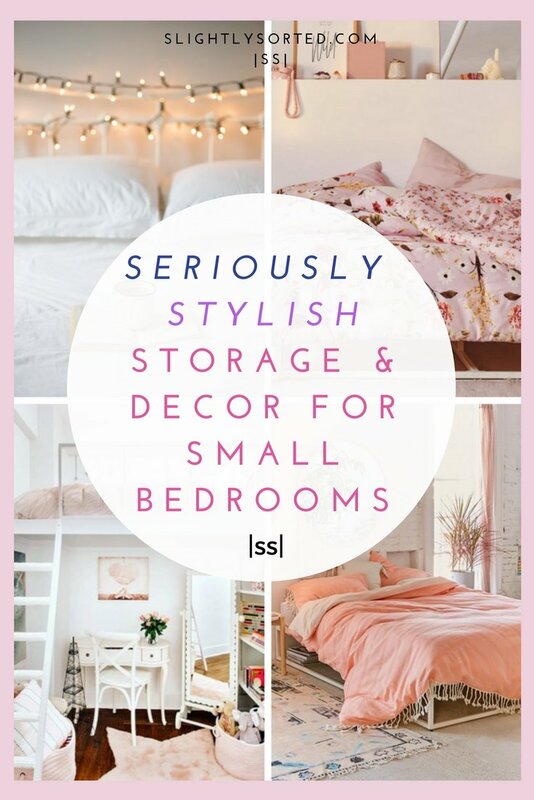 When it comes down to it, one of the best ways to make the most of your small bedroom space is to get clever with your storage. There are no end of nifty storage solutions out there, it’s just a case of finding them. 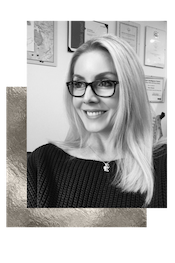 To make things a lot easier for you, here are five of my hands-down favorites! We all need somewhere to store ‘stuff’! There are always going to be bits of paperwork, magazines, towels, stationery… the list goes on… that we just need to put somewhere, and have easily accessible. 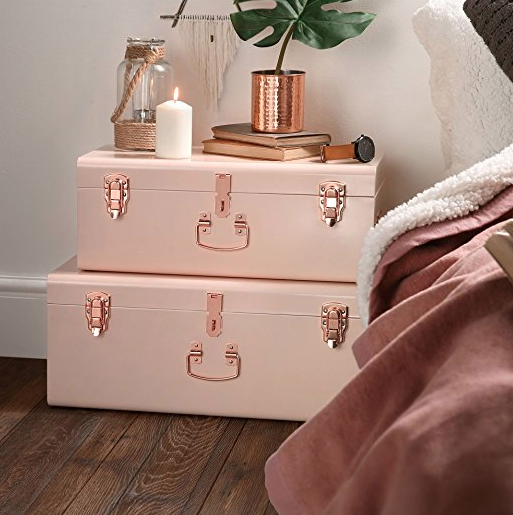 These beautiful trunks are perfect for small spaces because they’re stackable, and you can use the surfaces as extra space – perhaps at your bedside for your books and clock, or just for displaying a nice plant and a couple of stylish accessories. The fact that they’re light and bright means that they won’t create a cluttered feel in your room. They come in light pink, white, and light grey. We all need somewhere to work on the laptop, but if that place needs to be in a small bedroom then things can get tricky. 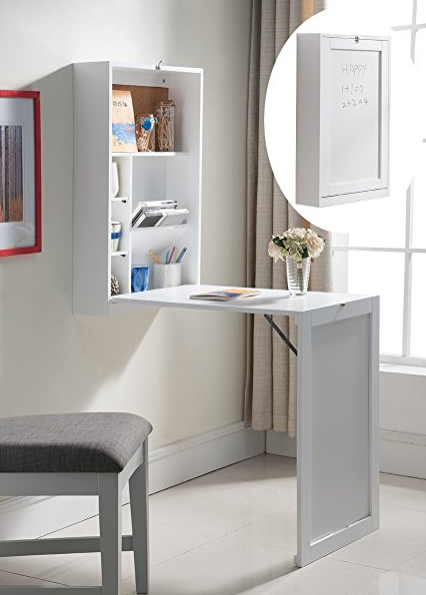 Avoid using up tons of floor space with one of these amazing wall-mounted fold-out desks, complete with storage space for all your stationery. When you’re really trying to save on floorspace, lift whatever you can off it! 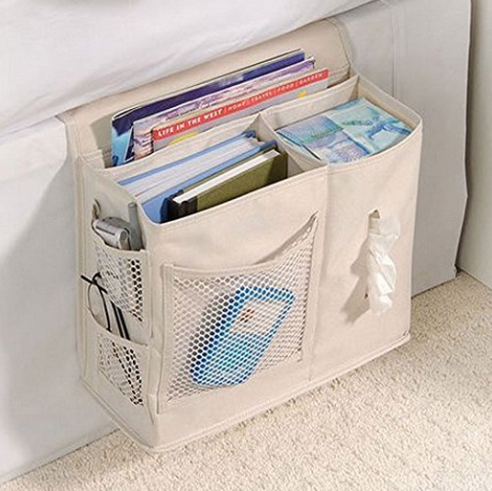 This little storage caddy that hooks under your mattress is a really simple way to store all your bedside bits and bobs so that you can do away with any kind of bedside table. 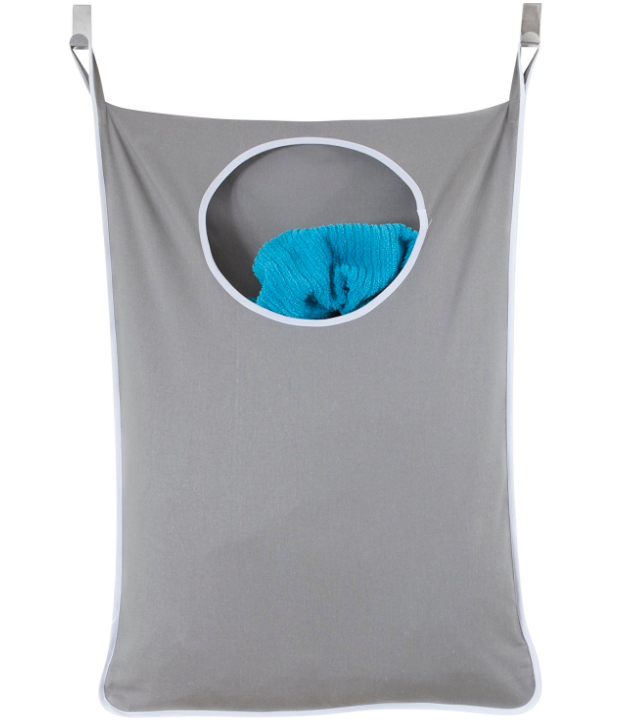 Not the most glamorous or pretty of storage solutions, but vacuum storage bags are amazing for compressing your out of season clothes if you have limited clothes storage space in your room. Because what’s the point in taking up valuable floor space with something so boring? I like this one, and it’s a bargain. So what are you waiting for! 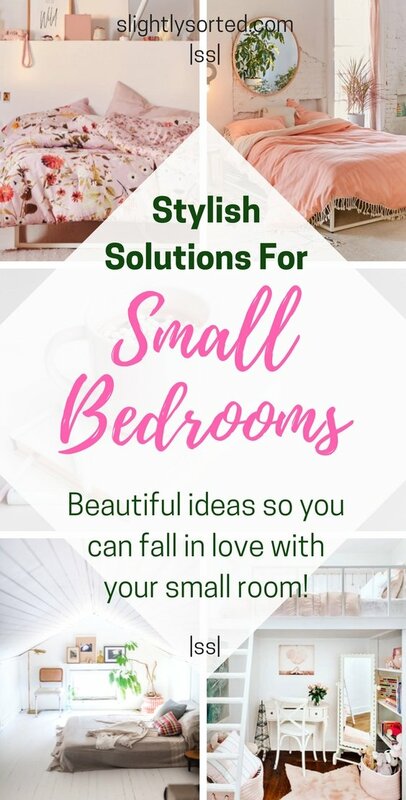 I’d love to know if these stylish bedroom ideas for small rooms helped you, or maybe you have some tips of your own! For tons more bedroom ideas, you can go over to my huge Pinterest board. Enjoyed this post on stylish bedroom ideas for small rooms? Why not save it for later on Pinterest! Love these ideas. I’m going to try a few this week for my small bedroom. Glad you like the ideas Amber, hope you find something that works for your room!